Unlock 11 exclusive video lessons. Can we capture the unpredictable evolutionary and emergent properties of nature in software? Can understanding the mathematical principles behind our physical world help us to create digital worlds? This class focuses on the programming strategies and techniques behind computer simulations of natural systems. We explore topics ranging from basic mathematics and physics concepts to more advanced simulations of complex systems. Subjects covered include physics simulation, trigonometry, fractals, cellular automata, self-organization, and genetic algorithms. Examples are demonstrated using the p5.js environment with a focus on object oriented programming. In this session we’ll review the basics of p5.js and get everyone up and running with posting sketches online. We’ll look at how object-oriented programming works in JS and create simple sketches of objects moving around a canvas. 4. What is a Vector? This session will look at the concept of a vector and implement sketches using a p5.Vector object. By creating objects with vectors for position, velocity, and acceleration, we’ll build a simple “hello world” physics engine. This session, we’ll examine a special kind of force (pioneered by Craig Reynolds) — a steering force — that moves an object according to its own goals or desires. Examples are wandering, seeking a target, path following, obstacle avoidance, and more. We’ll then look at how group behaviors can be simulated by combining multiple steering behaviors according to local interactions between objects. 2. What is an Autonomous Agent? In this session we will cover the concept of a fractal and look at ways of generating fractal patterns with code. This session will look at the key concepts of Darwinian evolution — variation, selection, heredity — and examine how they can be applied in a computer simulation. 2. What is a Genetic Algorithm? 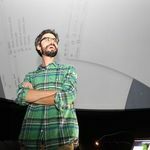 Daniel Shiffman works as an Associate Arts Professor at the Interactive Telecommunications Program at NYU's Tisch School of the Arts. Originally from Baltimore, Daniel received a BA in Mathematics and Philosophy from Yale University and a Master's Degree from the Interactive Telecommunications Program. As a co-founder of The Processing Foundation, he works on developing tutorials, examples, and libraries for the open source projects Processing (created by Casey Reas and Ben Fry) and p5.js (created by Lauren McCarthy). He is the author of Learning Processing: A Beginner's Guide to Programming Images, Animation, and Interaction and The Nature of Code (self-published via Kickstarter), an open source book about simulating natural phenomenon in Processing.